Posting about Sucuri Security’s redesign yesterday reminded me that I haven’t done a proper post talking about some of the recent updates to the WPCandy site design. If you normally read only via RSS, now’s a good time to pop over to the site proper and check out the (kind of new) look. There are a number of updates to the design that you might have noticed already. I’ll run through my favorites in this post. I’m really into subtle textures lately, which probably explains the new background on the site. The realignment also introduced a few more rounded corners than before, and better proportions throughout the layout. The “tightening” includes boring things like equal spacing, improved and consistent form styles throughout, and a few more subtle touches on elements that have been around on WPCandy since the relaunch. One of the biggest criticisms of WPCandy for some time has been its lack of a mobile-friendly layout. That hasn’t been entirely fixed yet, but the first steps toward a proper responsive site have been taken; the blog should be usable no matter what device you’re growing it on. This is one area I’m still actively tweaking every few days. Let me know if it ever seems broken to you. One of the areas of the realignment that I spent the most time on was rethinking the site navigation. I won’t bore you with the whole process, but suffice to say I spent some time going through a few IA exercises and came out the other end with a better grasp of how content should be presented across the site. For instance, the primary blog navigation has been overhauled. It used to list blog categories like news, opinion, tutorials, and so on. Ultimately those links weren’t used that often, since most just glance over the blog each day to see what’s new. The categories are important links, sure, but they aren’t important enough to be the primary navigation. There’s also now a bar running across all the major WPCandy websites, connecting them and making browsing a bit easier, I think. It links to the blog, the magazine, Pros, and the WPCandy Stream. As you browse the site, you’ll hopefully begin to notice helpful sub-navigation popping up here and there. With a better idea of how each element of the WPCandy website fits into the greater picture it’s easier to connect relevant pieces to one another. Before I move on, I would absolutely recommend that anyone looking at improving their website include a proper information architecture review in your process. Particularly for a site with a lot of content, it can make a world of difference when it comes to pushing out a redesign. Previously, the design of the WPCandy Stream was really no different than the rest of the site. The player and chatroom were embedded within a page on the site, and that was really it. The new design makes things a bit more special, in order to properly reflect the amount of attention we’ve been paying to the Stream. If you haven’t visited the Stream yet, I recommend you check it out sometime. It’s getting pretty cool. There’s a lot still on the radar for WPCandy: bringing the community aspects of the site forward more, an even better mobile website, and a more cohesive logged-in experience are all on the docket in the near future. 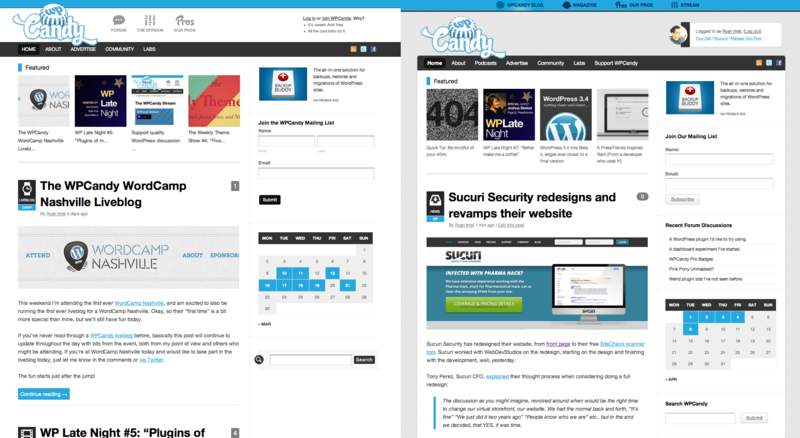 I hope everyone enjoys the (slight) redesign, and as always thanks for being a part of our community here at WPCandy! The responsive design is a huge improvement, thank you! That’s a pleasure to be able to read the news from my mobile now! You’re welcome Jeremy. It was on the list for a long time — it feels good to have it fixed up now. GREAT job with it Ryan! Looks very clean, I’m a fan of it. Thanks Jonathan, I appreciate it. Really like the new navigation & button effects. Re design looks very clean and professional.